Ante has always feared Florence and her gang, and when she gets to the height of her anger at Florence’s bullying, she throws some pepper in her face. Florence gets really mad, and Ante knows she is for it, so climbs to the forbidden organ loft and hides. The organ loft is forbidden because it is old and unstable. Rumour has it a boy fell from the organ loft one hundred years ago and died. Florence is approaching and is on a cracking stair on her way up to the organ loft – when all of a sudden, a shadowy boy appears and Florence falls as the stair gives way – and Ante blacks out. 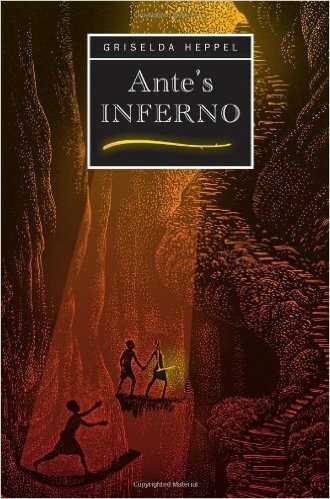 When Ante wakes up, she is not in school, but in Hades, the underworld. The shadowy boy was the boy who fell from the organ loft, though there is more to his fall than the boy ( Gil ) makes out. Ante and her friends ( sort of her friends anyway ) try to escape from the underworld so they can get home to where they belong. Before they do, they see many strange sights. These include people who have committed one of the seven sins, people queuing up for the boat ride to afterlife in heaven as well as the journey to their place in Hell. How will they escape? And what happened to Florence? I really really like this book. It is based on the poem “Dante’s Inferno” ( which is a long poem, like a story, written in the 14th century ) which I have also looked up, and it was fun spotting the differences and similarities between the two stories. I like how everything has its own way, and how everything has been modernised. I also think the devil ( although he is not sure about the name “devil” and so would probably prefer to be called Lucifer ) is quite funny and ironic. It is also very clever how the author has weaved modern ideas into the stories without destroying the old ideas from Dante’s Inferno. The author has also written another book, based on Doctor Faustus, called “the Tragickall History Of Henry Fowst “. Banana Girl, you have a future in book illustration! I LOVE this. 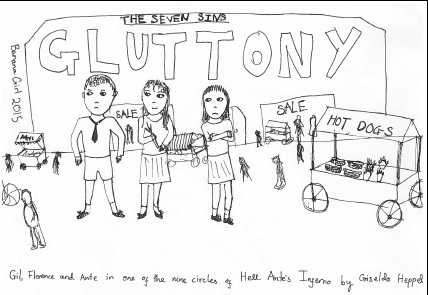 Perfect depiction of Ante, Florence and Gil, right down to Ante looking fed up at being left out by the other two. Super review too – I’m so glad you enjoyed the book.